"Mr. President, I think people down here know it was a big storm. Over half a million of them fled the hurricane. It's been a full year, and only 170,000�far less than half�have come back. And none to their own homes." Greg Palast is one of those rabblerousing investigative reporters constantly suspicious of the government�and as a rule that's something I wholeheartedly endorse. I'm not a big fan of his jaunty Panama hat and perpetual smirk (seems a tad too image aware), but the act of poking sticks in the beehive�even if everything is a-ok and legit�sort of guarantees that there will be people watching those in charge to make sure things don't ever go too far out of control against the little guy, a.k.a us. Even when I disagree with the message, I always appreciate the suspicious zeal and effort. 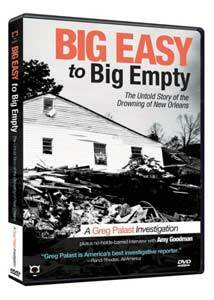 Big Easy to Big Empty is Palast's take on the devastation of Hurricane Katrina, an alarmingly short 27-minute doc shot on the eve of the one year anniversary of the massive storm. There's been a lot of discussion in various media outlets about the federal government's slow response and what was known in advance about the condition of the levees, and even darker beliefs that the poor and homeless were purposely left to wash away in order to create�in Palast's words�a "Six Flags Over Louisiana" Republican tourist town. He purports to answer questions like "why did they have to leave?" and "why can't they come back? ", and attempting to do so in less than a half hour is unfair to the material. The problem is that he tries to do too much in a short amount of time and never truly answers his own questions, ultimately diluting the impact of everything. Palast's main point is that the federal government (including the President and FEMA) knew the levees were in the process of giving way 24 hours before they did, and yet notified no one. The narrative bounces around to a number of isolated subjects that each could have probably been their own separate documentary, and he ends up fragmenting his primary point into almost an afterthought. His verbal pistol-whipping of an administrative assistant at the company that supposedly had been paid to come up with an evacuation plan seems like corny grandstanding on his part, a cheap attempt to look the part of the rogue reporter. And when Palast hits on something truly startling and not as well-known�like the public housing project that was permanently evacuated allegedly at gunpoint and locked up despite not being damaged by the storm�it is introduced, discussed and then pushed aside when I still had more questions I wanted answered. That's a huge story if you ask me, but Palast has too many stops on his way to selling the "reckless negligence" theme, and when he casually mocks the French Quarter for selling Hurricane drinks (something introduced way back in the 1940s) it suddenly seems like he's grasping at conceptual straws. I was eager to listen to Palast's claims here, but I was left with a great sense of confused, unfocused indifference when it was all over. I've become curious enough to want to seek out Palast's Armed Madhouse book, in the hopes that maybe in written form the message is somehow more consistently coherent. Some of the material did anger me a little (as it should, I suppose) but just as much of it seemed to wander off the mark, and when you're working with a 27-minute runtime that opportunity just isn't there. Image Transfer Review: The 1.78:1 nonanamorphic widescreen transfer here is about what you would expect for a low-budget guerilla-style doc. There is a moderate variation in quality throughout, but most of the on-location interviews and footage carry decent colors, though edges tend to be on the soft side of things. The print is clean, and free of any nicks or dirt. Audio Transfer Review: The audio is presented in PCM 2.0 stereo, and is tolerable yet hardly flawless. Understanding what people were saying is never an issue, though there is a significant amount of crackle and distortion in spots. Extras Review: The supplemental material runs twice as long as the feature, and one of the segments actually does a better job than the main film. Democracy Now's Amy Goodman Interviews Greg Palast (30m:08s) is pulled from Link TV and in thirty minutes does a stronger, more focused explanation of the events in New Orleans, or at least per Palast's beliefs. Sure, Goodman doesn't exactly put the journalist on the hot seat (she's known as "radio's voice of the disenfranchised left"), but the information here seems far more disturbing and frightening than it does during Palast's doc. A set of two extended interviews of people featured in the main feature are also here�Interview With Malik Rahim: Common Ground Relief New Orleans (11m:12s) and Interview With Dr. Ivar Van Heerden: LSU Hurricane Center (12m:13s); the input of Van Heerden especially is worth a listen. An automated Photo Slideshow: New Orleans One Year Later (11m:38s) seems more like a set of still from Palast's film than an actual photo journey of the city, and There Is Nothing New Under the Sun: Audio Excerpt From Armed Madhouse has a chunk of Palast's book read by Brod Bagert, comparing past history to current history. Also included is a six-page "collector's booklet" where Palast talks about how he had charges by Homeland Security brought against him and features followups on three of the people interviewed in the film. The main feature runs less than 30 minutes, which doesn't seem nearly long enough to even scratch the surface on the volatile issues Greg Palast wants voiced. I get his message, but the presentation here seems a little scattershot to effectively tie it all together, something that some of the supplemental material actually does a better job at.